Preheat your oven to its lowest setting (around 150°F). Line a large baking sheet with parchment paper, and place 8 English muffin rings on the paper. In a small bowl, mix together the water, honey, and yeast. Set the mixture aside for 5 minutes until frothy. In a medium-sized bowl, combine the dry ingredients. Add the yeast mixture and the wet ingredients to the dry mixture. Mix well with a hand mixer. (If using almond flour or sunflower flour, let the dough rest for a couple of minutes to thicken.) Stir before scooping. Lightly spray the English muffin rings with cooking spray. You can grease them as well, but if you do, the muffins will stick a little and will need to be loosened with a knife. Scoop about ½ cup of batter into each muffin ring (or enough to fill the ring to within ¼-inch of the top). Smooth the tops with a spoon if needed. Place the muffin tray in the oven, close the door, and turn off the oven. Let the muffins sit in the oven for 10 minutes to rise slightly. Leaving the tray in the oven, set the oven temperature to 350°F. Bake the muffins for 20-22 minutes from the point you turn the oven on (not when it actually reaches 350°F) or until they are golden brown and the tops are firm, but spring back to the touch. Let the muffins cool completely on wire racks. Once cool, remove from the rings. Use a fork to pierce around the entire edge of each muffin, and pull the tops and bottoms apart gently. Place a small square of wax paper between each split English muffin. Place the muffins in a 1-gallon freezer bag and freeze until needed. 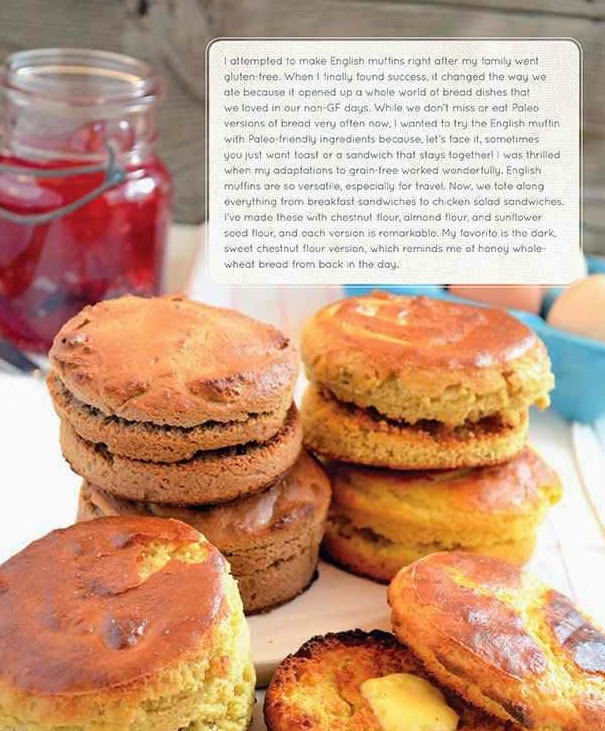 These paleo english muffins work great straight from the freezer with no need to thaw first. Remove them from the freezer, and use a butter knife to separate the tops from the bottoms. Toast as usual, and enjoy! These goes best when accompanied with the delicious mango cilantro chicken, you just have to try it out!